Anyone interested in Afro-American history and culture in this century, or interested in book collecting and libraries in general, will find Dr. Sinnette's study a rewarding, even engrossing experience. Elinor Des Verney Sinnette is Acting Director of Howard University’s Moorland-Spingarn Research Center. A former staff member of The New York Public Library, a teacher of librarians from Central Harlen to Nigeria and Kenya, a consultant to UNESCO, Dr. Sinnette has long been a contributor to the study of the history and culture of black people throughout the world. 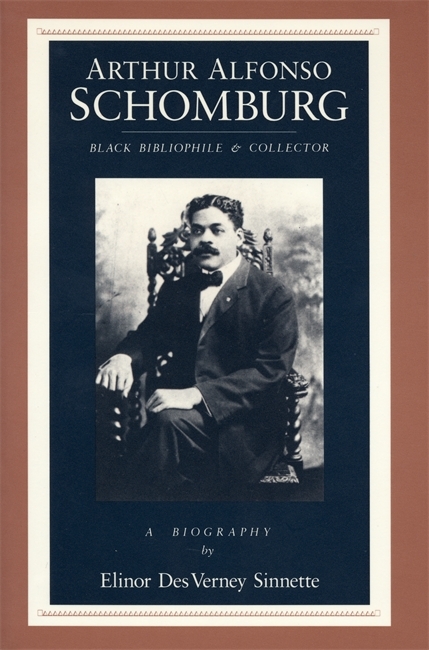 In her informed and highly readable portrait of Arthur Schomburg, Elinor Sinnette has captured the spirit and tenacity of the man totally dedicated to putting the work of Black writers and thinkers on the literary map of the world.